Stars are basically large balls of hot hydrogen gas, and the macroscopic properties of a hot gas are governed by the Ideal Gas Law of chemistry. An ideal gas is a gas that conforms, in physical behavior, to a particular, idealized relation between pressure, volume, and temperature. The ideal gas law is a generalization containing both Boyle's law and Charles's law as special cases and states that for a specified quantity of gas, the product of the volume, V, and pressure, P, is proportional to the absolute temperature T; i.e., in equation form, PV = nkT, in which k is Boltzmann's constant and n is the density of the gas. Such a relation for a substance is called its equation of state and is sufficient to describe its gross behavior. Although no gas is perfectly described by the above laws, the behavior of real gases is described quite closely by the ideal gas law at sufficiently high temperatures and low pressures (such as air pressure at sea level), when relatively large distances between molecules and their high speeds overcome any interaction. A gas does not obey the equation when conditions are such that the gas, or any of the component gases in a mixture, is near its triple point. The ideal gas law can be derived from the kinetic theory of gases and relies on the assumptions that (1) the gas consists of a large number of molecules, which are in random motion and obey Newton's deterministic laws of motion; (2) the volume of the molecules is negligibly small compared to the volume occupied by the gas; and (3) no forces act on the molecules except during elastic collisions of negligible duration. While all the above conditions are not strictly true, (where they breakdown interesting things happen - such as friction) in general the behavior of matter is well described by this kinetic theory. Temperature is explained by atomic theory as the motion of the atoms (faster = hotter). Pressure is explained as the momentum transfer of those moving atoms on the walls of the container (faster atoms = higher temperature = more momentum/hits = higher pressure). Stars form from clouds of gas and collapse under self-gravity. The collapse is stopped by internal pressure in the core of the star. During the collapse, the potential energy of infalling hydrogen atoms is converted to kinetic energy, heating the core. As the temperature goes up, the pressure goes up to stop the collapse. The heat from the collapse is sufficient for a star to shine, but only for a timescale of 15 million years (called the Kelvin-Helmholtz time). Since most stars are over 10 billion years old, then they must be producing its own energy rather than shining on leftover energy from formation. At a star's surface the energy is released to form the spectrum of the star. There are three ways to transfer energy; conduction, convection and radiation. Conduction, the collisional transfer of energy between atoms, only occurs between solids (such as a hot pan and your hand), so is not found in stars. Only convection and radiation transfer are important in stars and the opacity determines which method is used. When the temperature gradient is low and all the atoms are stripped of their electrons, the opacity is low and radiation transfer is dominant. When the temperature drops, and the temerature gradient is high, such as in the outer layers of a stars interior, the protons and electrons recombine to form atoms and the opacity goes up. High opacity slows the transfer of energy by radiation, so bubbles form. These bubbles are hot and low in density, thus starting a convective flow. Whether convection or radiation transport is used depends on the temperature make-up of the stellar interior. When the changes in temperature are sharp, convection is used. Think of the photons as grains of sand on a pile. If the pile is low, radiation is used. If the pile is high, the sand tumbles down, convection is used. At a star's surface the convective cells release energy, as shown in this supercomputer movie. energy production - in the case of stars, energy is produced by thermonuclear fusion. This can be either the proton-proton chain or the CNO cycle. These 5 relationships, stated as mathematical formula, show how energy is generated, how that energy effects the structure of stars and how that energy is transported to the surface to make a star shine. A star is divided into six regions based on the physical characteristics of these regions. The boundaries are not sharp, and the regions vary in size from star to star. For example, hot stars have larger radiative zones and smaller convective zones. The reverse is true of cool stars. Stars rotates differentially since they are not solid. The stellar equator for a solar mass star completes one rotation in 25 days. The poles complete one rotation in 36 days. Flares, arcs and prominences are linked to stellar activity, very small changes in stellar luminosity . Gas is trapped in the flux lines created by the starspots and lifted off the photosphere into the chromosphere. Over a period of a few hours, the magnetic fields collapse hurling the hot gas outward (much like a breaking rubber band). The corona of a star is a large, white halo of glowing gas. The corona gas is extremely hot (temperatures on order of a million degrees) and is the source of the stellar winds. A stellar wind is a constant stream of sub-atomic particles moving at faster than the escape velocity of the star's gravitational field. 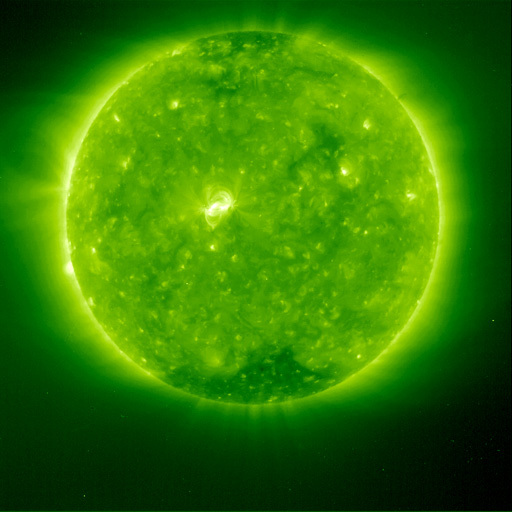 They escape through windows in the corona, called coronal holes, regions where the magnetic fields are weak and the charged stellar wind particles are not trapped in magnetic bottles. X-ray and UV pictures of the corona show that the hot gas is connected to the magnetic features in the photosphere. Those low level structures extending into long streamers in the outer corona and heat the corona to its million degree temperatures. Gases normally obey the Ideal Gas Law. However, when the atoms become very densely packed, special rules of quantum mechanics control the behavior of the atoms. In particular, the Pauli exclusion principle limits the number of particles of a given kind that can be put into a cubic centimeter of space. When the density of the gas reaches this limit it begins to behave like a liquid. For normal gases, when the density or temperature go up, the pressure goes up. For extremely high density gases, the pressure becomes almost independent of temperature and the gas is said to be degenerate. This happens for normal matter when the density reaches 1015 gm/cc (for example, if you squeeze the whole Earth into a football stadium). The cores of normal stars are an ideal gas, and follow the ideal gas law. However, as hydrogen fuel is burned, helium is produced as a byproduct and begins to build up in the center of the star. Helium cannot burn at these lower temperatures, so the helium ash becomes denser and denser to reach degeneracy. The core can cool, but it doesn't contract because its internal pressure remains high even as its temperature falls. Thus, stars with low mass cores become white dwarfs, slowly cooling and radiating their heat into space.